Home → Our Doctors → Philip D. Campbell, M.D. Indeed, Dr. Campbell’s Knoxville roots run deep. His father, Dr. J. Ed Campbell, founded the practice that would become known as Drs. Campbell, Cunningham, Taylor & Haun in 1952. Inspired by the elder Campbell’s example, Philip decided to pursue a career in the medical field. After receiving his undergraduate degree from Tulane, he enrolled in Tulane University School of Medicine. During one of his medical school rotations, Dr. Campbell met Ocular Pathologist Dr. David Apple, who became a strong influence along with another professor, Dr. Thom Zimmerman. It was then that Dr. Campbell decided to pursue a career in Ophthalmology, eventually completing his internship and residency in Ophthalmology at Emory University in Atlanta. There, he was fortunate to study under George O. Waring, III, a pioneer in refractive surgery. Thanks to those early mentors, Dr. Campbell gained a strong foundation in Ophthalmology. 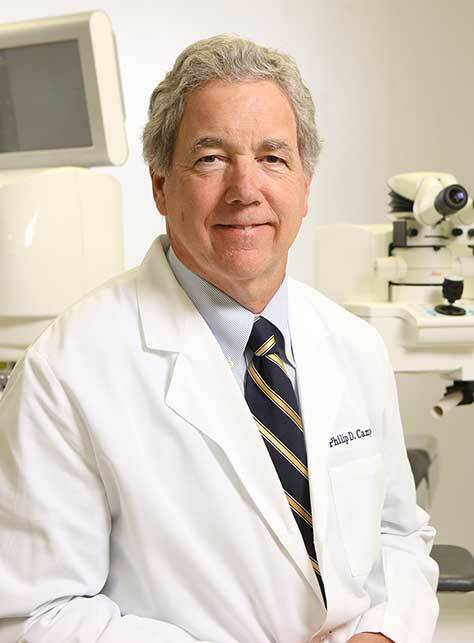 Those doctors also instilled in him the importance of staying at the forefront of technology—a lesson that was imparted early on by his father, Dr. J. Ed Campbell, who is the first surgeon to perform corneal transplant in East Tennessee. Upon completion of his studies, Dr. Campbell joined his father with Campbell, Patterson & McCoy (and today named Drs. Campbell, Cunningham, Taylor & Haun), which recently celebrated 60th anniversary as a Knoxville institution. Dr. Campbell is enthusiastic about the many new possibilities in eye surgery. “I believe we’re practicing medicine and performing surgeries in ‘the Golden Era of Ophthalmology’,” he says. “New advancements in technology, techniques and treatment options have made this an exciting time in eye care. This evolution that’s going on in modern eye surgery has made our work particularly rewarding,” Campbell goes on to say. When he’s not at the office, Dr. Campbell is usually with his family enjoying what most East Tennesseans like. On weekends, might find him in the outdoors enjoying activities like boating, fishing, hiking and traveling. But beware, Dr. Campbell is also an avid tennis player. Whether he’s performing the latest in refractive surgery or sweating on the tennis court, you can be assured that Dr. Philip Campbell stays true to his Knoxville upbringing, honoring a homegrown tradition.